Dun Laoghaire Musical and Dramatic Society (DMDS) will present a concert of their favourite pieces in the dlr LexIcon Theatre, Dún Laoghaire from Wed 30th March to Saturday 2nd April at 8pm nightly. 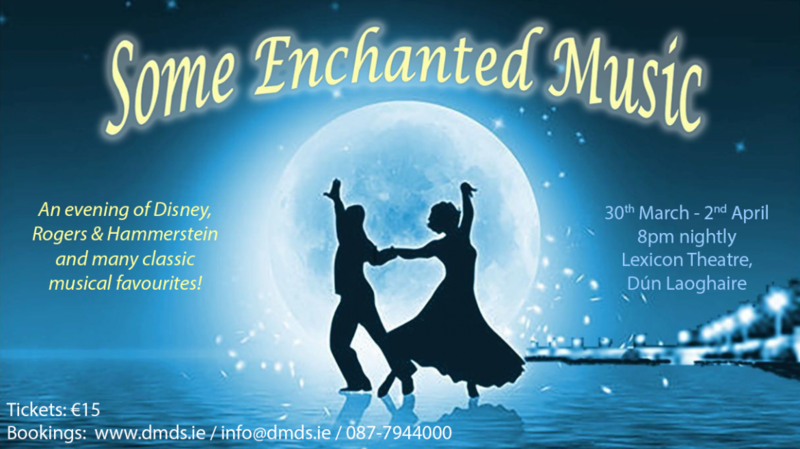 The concert, entitled ‘Some Enchanted Music’, will include a mix of choral and individual numbers from a wide variety of musical genres ranging from Disney classic movie tunes to favourites from Rogers and Hammerstein musicals. The Society have been entertaining south Dublin since the 1960s and have won many awards for their performances in Musicals, concerts and competitions and also for the performance of its choir. DMDS performances regularly feature in ‘Best in Ireland’ nominations and awards from the Association of Irish Musical Societies (A.I.M.S.). In particular, the Society has won the ‘Frank Cullinane’ Trophy for Best Choral Group in 8 of the past 10 years at the AIMS Choral Festival, including most recently in 2015. The Society has also regularly won the Ballyclare Rosebowl trophy for the best Cameo performance (i.e. presentation of a scene from a musical) at the same festival. They are also regularly invited to perform at local cultural events.